Thanks for this site and your work. I have learned a lot on here, and I believe that's why my tanks have done well. I have 10-gallon tank with a male Betta (not sure of his age, but he's been fine for months and has healthy-looking fins and color). He shares the tank with five leopard Corys, a pair of Otos, some watersprite and a potted Swordplant. The tank has several rocks and light gravel (large pebbles, really) covering most of the bottom of my tank. I have an idea to create a cave by laying a small glass jar or clay pot on its side and tying java moss to it until it takes and grows on its own. What do you think? Would java moss grow on a jar or pot? I am having a problem with runaway Christmas Moss. I bought a plant package which included Christmas Moss. Prior to ordering I talked to the grower about my needs. Mainly, that I was creating a Discus Tank, and needed warm water plants. The temp in my 72 gallon tank is around 84 degrees w/o heater, with the lights on. ( I live in Florida) The Christmas Moss has turned to brown, and has spread to all areas of the tank. When I try to pick it out of the other plants, it fragments apart and spreads through out the tank. It is clogging my other plants leaves, and ornaments. It is too fine to pick out. Our fish are old and big. Jack Wattley Discus are very expensive. 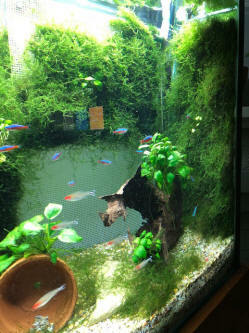 We worry about having to tear the tank apart, or pulling all the plants out, and moving the fish. Thank you for the return email. The reason I mentioned anaerobic fluctuations affecting my fish, and was seemingly paranoid, was my past incident. Prior to a past weekly water change, (40%) I did some aquascaping. I move 3 large plants, replanting them. After doing the water change(aged, treated water, as usual) I noticed the Celebese Rainbows at the surface trying to breathe. I tested for nitrates, which where very high, I turned on the air stone, and dosed the tank with Super Bac which nullifies nitrates, and thought I had avoided any fish loss. However I did loose some of the rainbows a few days later. They seemed not able to breath, hanging at the surface. Luckily, the Discus were not affected. Asking more experienced folks, (like you) at Wattley's' Discus, and Big Al's, they diagnosed the issue as anaerobic fluctuations. 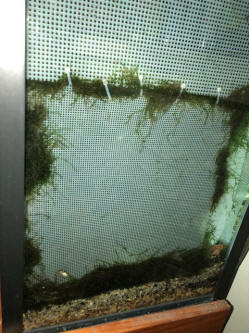 I inquired as to how to aquascape without fish loss, and was told to follow the replanting with 100% water change. I am since paranoid about the incident, and have not replanted since.